Instability of cerebral blood vessels and nerves can lead to abnormal sensitivity of the tissues in and around the head. 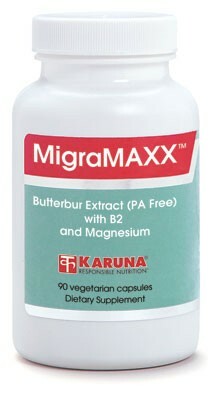 MigraMAXX contains three natural remedies for the prevention of these instabilities. Butterbur (Petasites hybridus), standardized for petasins content and processed to remove undesirable pyrrolizidine alkaloids, has emerged as a powerful influence on vascular tone and nerve sensitivity, partly through inhibiting effects on leukotriene synthesis. Magnesium participates in the regulation of vascular tone and reactivity by influencing platelet function, acting as a mild calcium channel blocker, and regulating the effects of serotonin and other neurotransmitters. Riboflavin may help correct certain mitochondrial dysfunctions related to instability of cerebral vasculature. Standardized butterbur extract contains petasin and isopetasin, which have spasmolytic, analgesic, and leukotriene-inhibiting properties (Altern Med Rev 2001;6:207-9). Several controlled clinical trials attest to the safety and effectiveness of standardized butterbur extract (Eur Neurol 2004;51:89-97; Neurology 2004;63:2240-4; Inter J Clin Pharmacol Ther 2000;38:430-435). Butterbur products guaranteed free of undesirable pyrrolizidine alkaloids are the preferred form of this remedy (Praxis-Telegram Nr. 1/98:13-14). Riboflavin, which may help correct certain mitochondrial dysfunctions related to head discomfort, has also been effective in a controlled clinical study (Neurology 1998;50:466-70). Suggested use for adults: One capsule, with meals, three times daily, or as directed. Limit to one capsule per day for every 50 pounds of body weight.